Nature’s Sunshine Protease Plus combines protease enzymes to assist the body in breaking down proteins. As the aging process progresses, the human body manufactures few enzymes naturally, and supplementation may become necessary. When protease enzymes are not present or are at too low a level, the digestive system is unable to process proteins correctly. 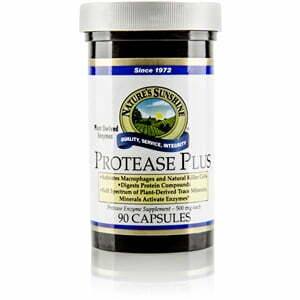 Protease Plus supports the immune system and overall health. The formula contains plant-derived trace minerals to aid in activating enzymes. Protease Plus capsules include 60,000 HUT protease and an herbal base of beet root fiber and plant-derived trace minerals. Instructions: Take 1-3 capsules between meals.